Misconception #6: Living in Costa Rica is paradise, right? Costa Rica IS a country with great physical beauty. There are beaches with palm trees swaying in the breezes. There are lush, green forests with incredible bio-diversity. And the temperatures are spring-like, all year round – no snow to shovel or ice to melt. So yes, there are definitely elements of “paradise” here. But it’s not perfect. The lush green that we see all around us doesn’t come without a six-month-long rainy season, with anywhere from 40 to over 240 inches of rain annually. 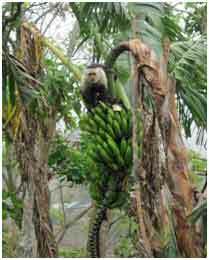 Where we live, near the town of San Ramon de Alajuela, we get about 120 inches each year. That’s a lot of rain! 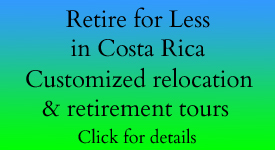 But over and above the weather, we are living in Costa Rica, not vacationing here. So, all the challenges people normally face in life, we face here – what to cook for dinner, how to live on a budget, how to stay healthy, how to deal with government bureaucracy, and even what to do all day. It’s almost impossible here to accomplish one-stop-shopping. There aren’t super-stores on every corner, so we normally have to go to several places to find everything we want. And then there’s the language barrier. This is a country where Spanish is the official language and many Ticos don’t speak any English. While we can both speak enough Spanish to communicate, this can be a big challenge for folks who speak little to no Spanish. 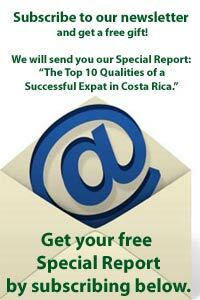 Bottom line – paradise, and life, is what you make it – whether you live in Costa Rica or anywhere else. 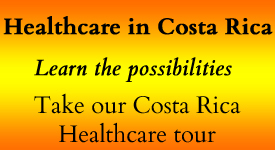 Announcing the 12 Days of Costa Rica Blog Tour—and we’re part of it! After living here for almost 8 years, I find I cannot imagine living anywhere else – and yes, this is paradise, but only because I have declared it as such. For me. It has taken a while – and I’ve had my ups and downs. Fortunately. I believe that it was by going through the downs that I found the ups. It has taken me time and effort to learn enough spanish, to have good solid relationships with my Tico neighbors, to understand fully that this Developing Country seems way behind in so many ways – and then, in a split second it jumps forward in ways I could not anticipate. I’ve learned to let go of expectations. All of them. and the stop using the words “should” or “exactly”. I’ve taken up the role of student – to be taught by Ticos – and I’m pleased when I see that I am making progress. So yes – this is my personal paradise and I’m staying.